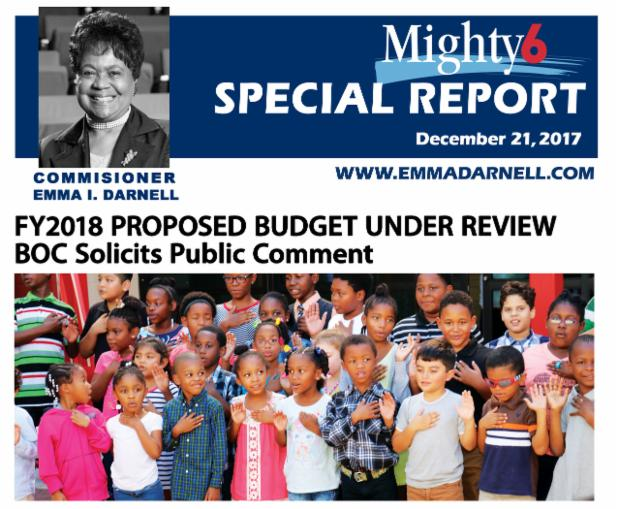 The FY2018 General (County-Wide) Fund Budget was presented to the Board of Commissioners on Nov. 15, 2017, for final adoption on or before Jan. 24, 2018. According to staff, the 2018 Budget is based upon a “status Quo” approach with no increases above 2017 funding levels for any areas with the exception of the following “Infrastructure Investments:” Facilities, Information and Technology (IT), Property Appraisal and Criminal Justice. “The (Proposed) General Fund Budget is balanced with FY2018 revenue of $986 million, a carry-forward deficit of $192 million for 2017 (created by a change in assessment policy) and FY2018 expenditures of $667 million,” the Report states. CLICK TO REVIEW or DOWNLOAD The FY2018 Proposed General Fund (County-Wide) Budget and the FY2018 FIB District (Unincorporated) Highlights.